Since time before the charlatan they called Christ walked the deserts outside Babylon, I have fed upon the terror and the bones of unruly children. My legend is immortal and I shall continue to feast on disobedient pups and wash my feet in their blood. Though my reputation ensures many a child grows into honorable adults, I fear that there are too many bad apples for me to sink my teeth into. Alas, though my power holds, its reach is not far enough and this world shall forever grow worse under the ravages of bad seed. The Krampus is a Slasher of Legend and he roams the World of Darkness every Yuletide in search of miserable little juveniles in need of punishment. In the beginning, the Krampus would only visit children in the night and sneak into their rooms to scare them. Though, as his legend grew, so did the terror and ghastly stories connected with him. His legend began to change his method of operation. Over centuries, the Krampus was shaped by the stories parents told their children to encourage good behavior and he grew from a simple frightener of the night into a horror that fed upon wicked children. What behavior attracts the Krampus variable and depends on the stories parents tell their children. Should a child defy a parent’s wish which was communicated in the Krampus story, then there is a chance the Krampus will attempt to collect the child during Yuletide, though the Krampus prefers the flavor of bullies, liars, and teenagers of any sort. What exactly constitutes a child in the Krampus’ eyes is determined by the culture, in most areas this begins when the child starts school (around 5 or 6) and ends when they are legally an adult (anywhere between 16 and 21 years of age). The Krampus can appear anywhere, but it is strongest where it’s stories are more prevalent. Austria and Bavaria are predominant in Krampus sighting; however, the Krampus often visits American towns where there is a large concentration of Germanic culture. The Krampus is vaguely human and is covered in short white fur (often splattered with the blood of bad children) and carries a massive wooden bucket chained to his back. The bucket is often filled with the appendages and blood of recent victims and both the bucket and its chain are used as weapons. The Krampus also has an elongated tongue that constantly lolls out of its mouth and with which he alternatively frightens children or tempts women. He also has two twisted horns protruding from his forehead. The Krampus can only target children that have defied parents that have threatened their children with his legend. The Krampus is truly immortal as long as his stories continue to be told to children and should he ever be reduced to zero health, he dissipates in a cloud of coal soot and returns to his ways the next Yuletide. The Krampus believes he is doing the world a favor and that his activities makes the world a better place. He thinks his presence inspires children to grow into good, responsible adults while he culls the bad seed from the world. He often monologues about such things when he claims rotten children to torture. The Krampus is known for more than his thirst for misbehaving children and is known for his lust for the ladies and his obsession with cleavage in particular. A woman can attempt to persuade the Krampus to leave a particular child alone with a Seduction (p84-85 World of Darkness core rulebook) roll. For this particular roll, equipment rating is determined by the woman’s bust size (Storyteller’s discretion on how many dots). This bucket can be spun around as an All Out Attack that targets all opponents in a 3 yard radius and it also counts as a Close Combat attack (Strength + Weaponry). The chain connected to the Bad Bucket can be used as a weapon by itself. A successful attack causes continuous damage as the sins of the victim burn her flesh. The Krampus gains the benefits of specializing in the Bad Bucket, Favored Weapon, and Weaponry Monomaniac as these chains are actually considered part of the Bad Bucket and are just an alternate use. 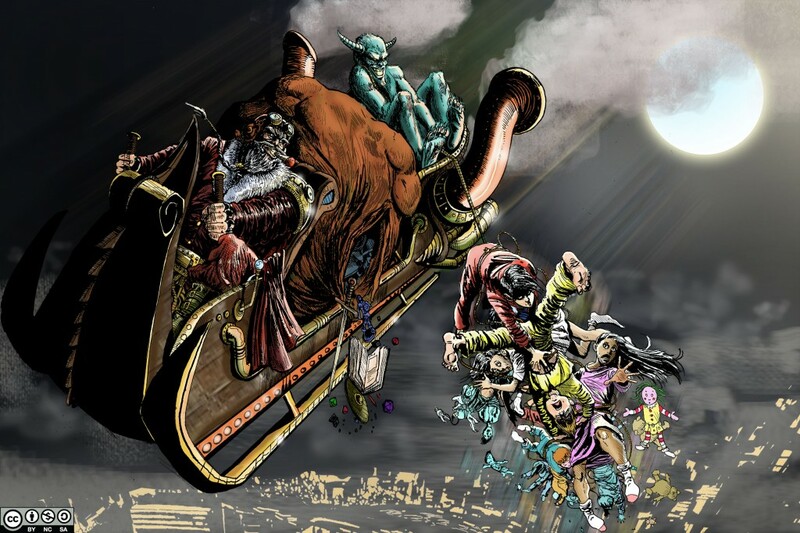 Be sure to visit Nevermet Press as they have kindly commissioned the art and organized the Krampus Karnival. I like it. Great villain! He reminds me of the emperor in The Boook of Vile Darkness…but with Christmas cheer!